Someone ate lunch along the brick wall along West End Avenue and left his trash. 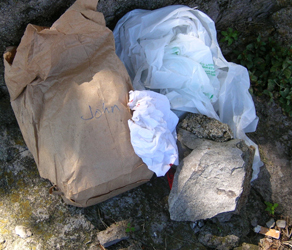 His name was John (visible on the brown bag). When I walked by a few minutes earlier, I noticed a homeless man with a grocery cart full of aluminum cans. I’m glad that he picked up the cans. I’m not sure if he left this mess, or if it was left by one of the workers in the office towers in the area. Anyway, it’s a great idea to brown bag your lunch. I do it almost every day, but please, clean up the mess. It’s a short post tonight. I’m getting ready to watch the Biden/Palin debate. This site is not to report the Nashville gas crisis, although I will continue to give daily updates until the situation improves. 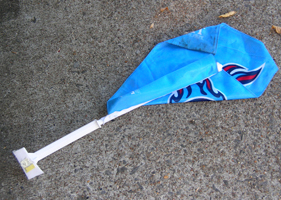 While waiting for the bus on West End Avenue Monday night, I found this Tennessee Titans car flag on the sidewalk. I’ve never bought car flags. As any I’ve wanted, I’ve just picked up off the street after they blew off someone else’s car. At one time, I had an American flag, Nashville Predators and the once popular Tennessee Volunteers car flags. Unfortunately, putting a flag on my car no longer appeals to me. Someone else can have this one. I’m not sure why it was discarded. The Titans are 3-0. Go figure. 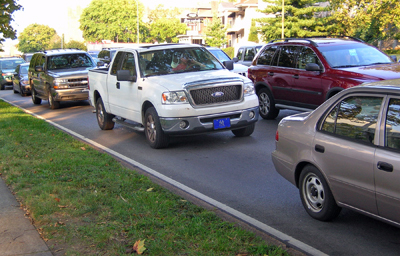 I watched lines of the gas-guzzlers along West End Avenue last night, as I waited for the bus. Where are they buying the gas?